Her freighter died two minutes later. But then, carebears never were good at predicting the future of their ships. 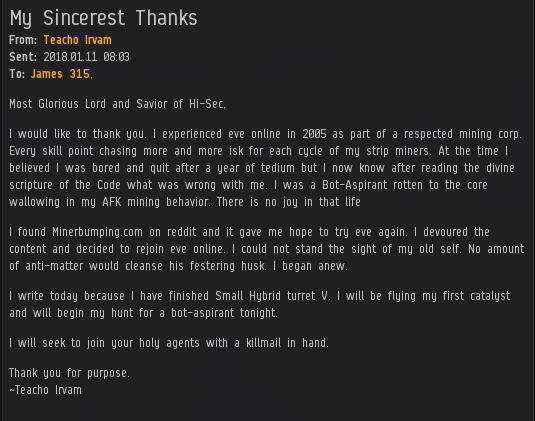 Welcome to another edition of the Highsec Miner Grab Bag! Zeus should've taken the hint, paid his money, and turned away from bot-aspirancy. He didn't. In fact, he was busy getting another exhumer ready. The miner didn't even bother changing systems. Zeus lost a 343 million isk Hulk and a 2.2 billion isk pod. His alt/corpmate, bigdaddad, remained in the system to lose a 388 million isk Mackinaw and a 3.4 billion isk pod shortly thereafter. Tears are getting expensive these days! Some people would have me change the Code to meet branrex's demands. "We need to broaden the tent," they say. Luckily, none of these so-called "moderates" are the Saviour of Highsec--I am. And I say, hold fast to the Code. Never let it go. Never compromise, for to compromise when it comes to the truth of the Code is to lie. As for the tent, burn it down. Sleep under the stars, basking in the glory of creation. We can reach 100% by eradicating everyone who disagrees with us. Victory is in sight. I believe that answers your questions, branrex. This is why you need to be careful when you seek intel from the in-game hauler channel. 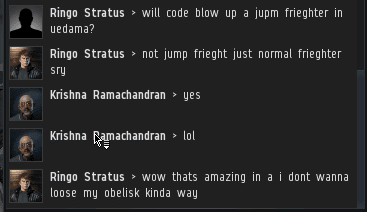 ...And this is why you need to be careful when taking a jump freighter through highsec. The destruction is accelerating: The mighty CODE. alliance has terminated a few dozen jump freighters in just the past month. More fake news from the hauler channel. Our Agents treat freighters from every alliance exactly the same: No permit, no ship. We've proven time and time again that we'll gank our allies if they disobey the Code. If you really want to "get" me, read the Code and all the MinerBumping posts. I'm sorry, Dimenieve, I really want to care about your concerns, but I can't get past the formatting issue. Please fix and resubmit. Thanks. 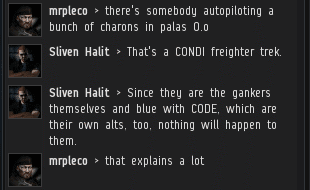 If Vexalia Nalaar had read the Code, he'd know that a mining permit costs 10 million isk. 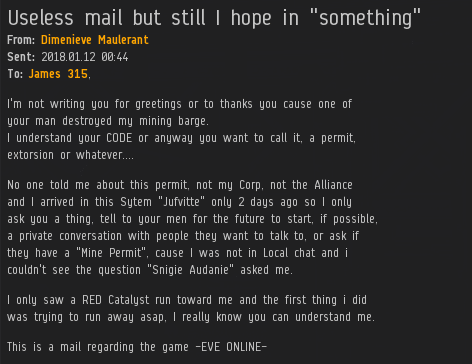 It's true what they say: You can't cheat an honest miner. Hey, no problem. I'm always happy to make someone's life better. Two illegal officer mining pods squished! Great job Aaaarrgg. I got one of my own the next day. "We can reach 100% by eradicating everyone who disagrees with us." Not sure if satire or CTA, but I'm in! 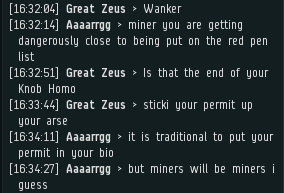 Kill all miners! Always! I've noticed around Sunday, most weeks, that the shitters all seem to clam up. I have heard several theories, but the most credible seems to be that they are overly religious. More than one of them may be active church staff (priests?). All that pedophilia that johnnie and his friends post would qualify as 'shocking' to only the most ignorant. So ag shitters act out all week with unspeakable vulgarity while hidden from public as an anom, then on sunday they have to put on the mask and act like 'normal' folks. 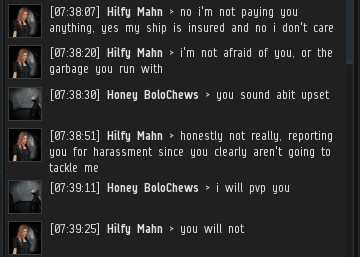 All you retards that would rather scrounge through the dirt to make imaginary pennies in a pvp game while crying over being blapped by pvp'ers should all make like kalynn, and quit, before you pull a RL shardani. Silly miners, where's your god now? 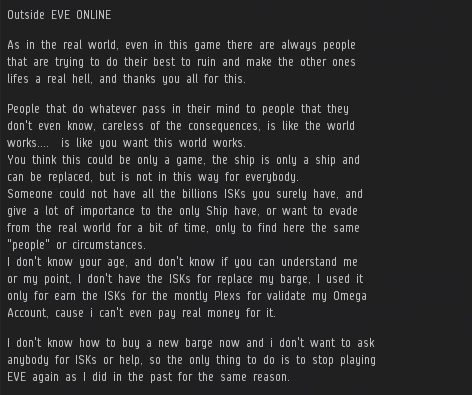 Our Savior is doing just fine saving highsec, in game, where that type of rp is acceptable, antigankers need to get an education and maybe leave the EVE until they are better equipped to understand it. Jamey: "Victory is in sight." No, it's not. I've made my billion ISK already this month, happily mining in various high security systems, without a permit. The more Jamey's CHODE. slaves tighten their dirty little fingers the more miners slip through their grasp.